Kolkata host Goa to prove state supremacy. Will they? Will ATK's two game-winning streak matter against the rampant Gaurs? ATK are on a two-match winning streak but will have a competitive FC Goa side to take on in the first Hero Indian Super League match of 2018. A third victory on the trot will confirm ATK's recovery, but the Goans will be hell-bent on rectifying a minor blip which came against FC Pune City. That a win will take FC Goa on joint top of the table at 15 points will be a huge motivating factor. "There's always an off day in office. We didn't take our chances [against Pune City]. 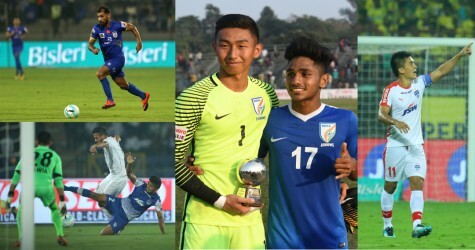 There were some decisions which went against us but that happens in football and you have to forget about it and get back to winning ways while sticking to our style, formation and play football that is enjoyable," said Goa's assistant coach Derick Pereira. He also informed that Goa had been training to become tighter at the back because they were being punished for too much focus on attack. The entire team has travelled to Kolkata and are injury-free. Pereira said that the sudden change in plans - this match was scheduled for 31st December 2017 - was a bit of a concern but at the same time, Goa had used the extra two days to prepare well. "It's an important match for us because we will also be facing a different style of play but we will focus on [maintaining] ours. We got two extra days but we were ready for the 31st too," he said. Meanwhile, pressure on Teddy Sheringham would have eased a bit after wins over Mumbai City and Delhi Dynamos which got them move up the table again to 7thspot. As defending champions though, they need to maintain their momentum to get anywhere close to the top four. The gap between them and 4th-placed Mumbai City is five points, but ATK have two games in hand which they need to make the most of. Sheringham's side has been rejuvenated by the performances of Robbie Keane and the head coach was effusive in his praise. "He's a world-renowned player and every day he does something special in training and the players are looking up to him. Which is why I asked him to come here," Sheringham said. The former Manchester United striker said that he didn't care much about home or away form - it was a statistic that was highlighted by the media - but he also defended his playing style compared to the form of the side. "It's not like we've decided to sit back and defend. We've attacked teams from the off. We have the same mindset - score goals, and the earlier the better. But sometimes it just doesn't happen like that," he explained. For ATK three points against the Gaurs and a third win in a row would mean a real statement of intent.